Please help distribute this press release to any press contacts you have and to groups and individuals you know. Following the press release, below, please see raw video media files we got from the October 21, 2014 Superior Court judgment to evict the collective from the CHE CAFE at UCSD. SAN DIEGO – On Tuesday, October 21, 2014, at approximately 10:00 a.m., San Diego Superior Court Judge Katherine Bacal issued a ruling in favor of UCSD in the eviction lawsuit filed by the Regents of the University of California/UCSD at the behest of a select core of administrators (“Administration”) against the C.H.E. Café Collective over the use of the iconic 34-year old, vegan, student-controlled venue and creative space, the C.H.E. Café. Upholding the Collective’s main legal theory, Judge Bacal rejected the Administration's claim that the dispute resolution provisions of the lease did not apply to the termination at issue in this case. However, she also found there was insufficient evidence that a formal request for dispute resolution had been made by the Collective, thus permitting the Administration to terminate the lease at will. Yet, the Administration had acknowledged a request for dispute resolution had been made but had argued it was mooted by a previous lawsuit filed by the Collective that was later dismissed. In addition, the Collective was reassured in various conversations that it was protected by a ‘holdover status’ provision in the lease and that it did not need to worry about an eviction. Completely disregarding these earlier reassurances, the University filed its eviction lawsuit and argued in court that dispute resolution was never formally requested by the Collective. Ignoring the true facts and history of negotiations, the Administration was able to convince the Judge that the formal requirements for invoking dispute resolution had not been followed by the Collective, and the Court ultimately held that thus the Administration had a right to terminate the lease with the Collective. The Collective and its supporters are disappointed by the ruling which upholds the Administration’s unfounded attack on the San Diego artistic landmark, but vow to continue to maintain its existence and legacy. Preparation for a possible appeal of the ruling and other legal action will continue. Organizing protest activity and lobbying will also continue. The C.H.E. Cafe and supporters believe the the student government councils and boards will do the right thing, once the true facts and history are laid bare. Likewise we believe that the Academic Senate and the State Legislature will be strongly opposed to the UCSD Administration's abuse of power, once they are fully familiar with the facts. The Collective and its current supporters renew their request that the Administration return to the negotiating table toward a mutually-beneficial resolution to this dispute. The Collective invites any and all supporters to join it in DEMANDING that the Administration cease its attack and roll back the eviction process. We note that this is not the first time that the UCSD Co-ops have been threatened with completely unjustified evictions. 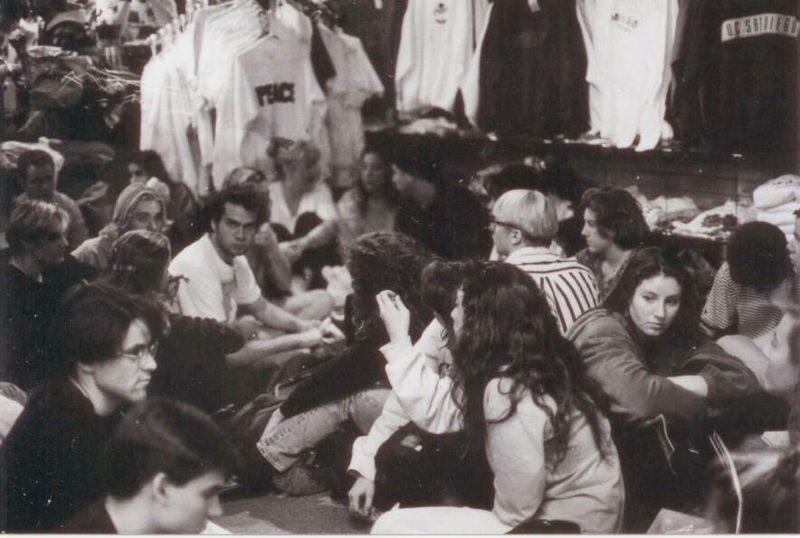 On more than one occasion students have been compelled to physically occupy and sit-in at the Co-ops to block eviction attempts by the University. · The C.H.E. Café (originally “Cheap Healthy Eats”), founded in 1980, is a student-run, cooperative, vegan café, venue, and creative space, hosting hundreds of independent artists and musicians over its 34-year history. It is one of 4 student cooperatives on the campus of UCSD. · UCSD’s Administration, ignoring the rights of students to control student fee-funded spaces, filed a lawsuit in court to evict the Café. The Administration’s bias against cooperatives, misunderstanding of the C.H.E. Café, and failure/refusal to work with students underlies its legal actions to force the Collective out of the student fee-funded space, despite years of good faith efforts by the Collective to comply with every directive of the Administration. The Collective has requested dispute resolution and negotiations with the Administration but has been rebuffed. · The Collective is asking the Administration to come back to the negotiating table and stop the expensive student/public fee-funded legal offensive against the space. · The Collective requests the help of the public at large and the San Diego art and music community to save the space and ensure that it is recognized and appreciated for the place it has in San Diego and UCSD history. Despite receiving hundreds of emails, calls, and letters of support from UCSD students, alumni, faculty, staff, organized labor, and community members, as well as petitions signed by over 14,000 supporters following its Notice of Termination against the Collective, the Administration opted to use student and public funds to hurriedly evict the Collective in court. The lawsuit followed the Administration’s rejection of several good faith attempts by the collective to negotiate the issues and a proposed resolution. The Administration argues that the 2006 Space Agreement between UCSD and the UCSD student/worker cooperatives, including the C.H.E., should be ignored. The agreement was intended to last through 2016, when the parties could then re-negotiate it. Instead, in late May when students were leaving for the summer, the University, along with members of the UCSD Graduate Student Association (“GSA”), secretly pushed through a flawed resolution "decertifying" the Collective, so the University could bypass the agreement. It is estimated that UCSD has spent at least $76,000 in public and student funds on its high-paid outside attorneys, including the firm Kimball, Tirey, and St. John, who was recently replaced by the firm of Paul, Plevin, Sullivan & Connaughton LLP (“Paul, Plevin”). Paul, Plevin specializes in the aggressive defense of employers when sued by workers over discrimination, harassment, wrongful termination, and wage & hour claims. The attempted eviction is the latest in the ongoing historical attack on the Collective by the Administration, which not only refused to meet with students to discuss any issues related to the Café, but actively interfered with the C.H.E.’s ability to operate as a café, including blocking a $35,000 grant to the CH.E. by another student organization and cutting off the gas lines at the Café so it could no longer cook and sell food (a large part of its revenue). Despite these attacks, the Collective repeatedly requested meetings with the University administrators, but the Administration continued to ignore and/or rebuff attempts to work together. The C.H.E. filed its own action against the University to challenge the alleged GSA decertification and is considering other legal actions. Meanwhile, the C.H.E. continues to operate as it has since 1980, as a student-controlled, democratically-run space on campus for students to have a safe and alcohol-free atmosphere for entertainment and meetings. Several fundraisers and other events have been planned, with more information to be released. Supporters continue to join the cause, not the least due to the hundreds of iconic artists and musicians who have been hosted over the years, including those listed below. At the Drive-In, Blonde Redhead, Black Dice, Blink 182, Botch, Bright Eyes, Citizen Fish, Billy Corgan, Chumbawamba, the Descendents, Deerhoof, Dum Dum Girls, Green Day, Hella, Inside Out, Jawbreaker, Jets to Brazil, Jimmy Eat World, Lightning Bolt, Los Crudos, Mike Watt, No Age, Pennywise, Rise Against, Sleep, Subhumans, The Dillinger Escape Plan, The Get Up Kids,The (international) Noise Conspiracy, and Unwound, among many, many others. Album Leaf, Antioch Arrow, Aspects of Physics, Crossed Out, Clikitat Ikatowi, Crash Worship, Rob Crow, Diatribe, Drive Like Jehu, Gogogo Airheart,Heavy Vegetable, Heroin, Physics, Pinback, Pitchfork, Patricia Rincon Dance Collective, Rocket from the Crypt, Struggle, Swing Kids, Retox, The Black Heart Procession, The Locust, Three Mile Pilot, Mario Torero, and Weatherbox, among several others. Raw video media files we got from the October 21, 2014 Superior Court judgement to evict the collective from the CHE CAFE at UCSD. Attached to this email is a photo from the 1992 student sit-in against eviction of the General Store Co-op. And a photo of one of the Camp Matthews barracks buildings (like the C.H.E. Cafe building) being removed from UCSD. The C.H.E. building is one of the last Camp Matthews buildings still in use at UCSD. Administrators have said, in writing that they "might" save the murals at the C.H.E. Cafe "if it is not too expensive".